The display on World War II history, which affected Washington County farmers and others, is coming to Vernonia. An exhibit coming to Vernonia explores the roles of Oregonians in the internment of thousands of Japanese people in the United States during World War II. The exhibit, titled "The Architecture of Interment: The Buildup to Wartime Incarceation," showcases eight panels of text, excerpts of historical documents, photos and other quoted materials to explain what led to the internment of Japanese citizens and non-citizens during the 1940s, and how Oregonians were involved. Throughout October, the exhibit has been traveling to various locations in the county. This week, it is on display at Scappoose High School, after previously being featured in Clatskanie and St. Helens. From Monday, Oct. 22, through Friday, Oct. 26, the exhibit will be on display in the Vernonia School library. Gigi Gordon, a member of the Columbia County Coalition for Human Dignity, said the coalition's stationary display is meant to be informational and to explain the historical context of previous social injustices in the country. "You know, it goes with that old adage, 'Those who don't learn history are doomed to repeat it, and that's exactly what's going to happen,'" Gordon said, drawing parallels between historical and modern events. Gordon said reactions to the display so far have run the gamut from visitors saying they were old enough to remember when Japanese internment happened, while others have said they learned something new by visiting the exhibit and hadn't studied the topic much when they were in school. Assembling the exhibit has been informational and inspirational in a sense, she explained. "This whole process of displaying the exhibit and putting it together has been so interesting," Gordon said. "We've got to remind people it happened so it doesn't happen again." On Tuesday, Oct. 9, the human dignity coalition hosted an evening lecture at the St. Helens Public Library featuring several guest speakers, including the former executive and founding director of the Oregon Nikkei Legacy Center in Portland, June Arima Schumann, and Chelsea Strautman, a St. Helens-based immigration and social justice attorney. 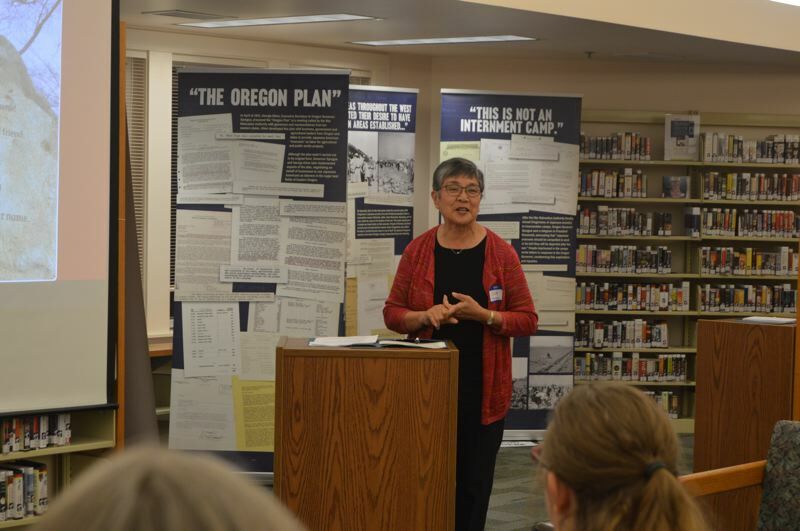 During the presentation, Schumann spoke about the historical significance and timeline leading up to internment of Japanese people in the 1940s, including local stories of those affected in places like Portland and Hood River. In Washington County, onion farming was a major industry in the mid-20th century, and many of the farmers were Japanese Americans. The impact that internment had on the local farming community is described by Gaston author Ken Bilderback in local history books such as "Creek With No Name: How the West Was Won (and Lost) in Gaston, Oregon." Speaking at the program in St. Helens, Strautman drew a connection between anti-Japanese policies during wartime with present-day immigration news and the challenges facing asylum-seekers trying the enter the United States. She discussed her experience working with U.S. Immigration Customs and Enforcement detainees held at a federal facility in Sheridan, about an hour south of Forest Grove, earlier this year. Elaine Nussbaum, a member of the Columbia County Coalition for Human Dignity, read excerpts from two books, "Only What We Could Carry" and "Legends from Camp," by Lawson Fusao Inada, a survivor of the internment camps who went on to serve as Oregon's fifth poet laureate. For those interested, a similar presentation to the one held in St. Helens will be given Tuesday evening, Oct. 16, at 7 p.m. in the Scappoose High library.